I enjoy writing about personal experiences with my family. I am interested in traveling, any culture, ancestry relationships and animals. Georgia mountain vacations are fantastic, as the mountains are beautiful and there is so many things to enjoy. My husband and I love to spend some time in the Blue Ridge Mountains when ever we can. We don’t exactly rough it. 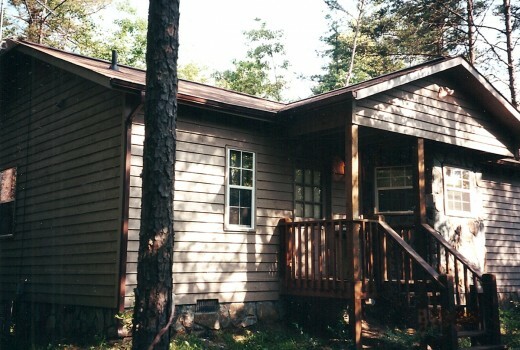 There are numerous Georgia Vacation Rentals, as well as, Georgia vacation packages. We have found a wonderful log cabin to rent in Blue Ridge that has a fully ready kitchen, fireplace, outdoor grill, indoor Jacuzzi, porch with swing, beautiful scenery and the living room has a TV with DVD player so you can stay in if it is raining and watch movies. 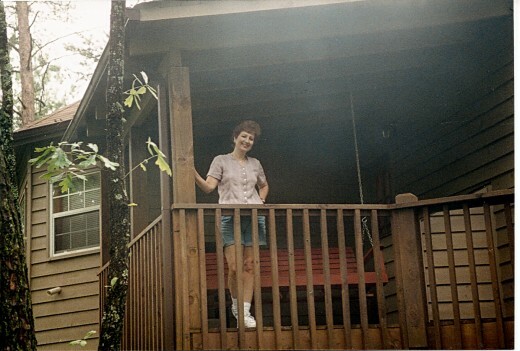 We have spent time in Blue Ridge in every season and have always had a wonderful time. There are also vacation condos available. When we stay in the cabin we do a lot of hiking in the mountainous area that is right by the cabin. One of the great perks of staying in this lovely cabin is the location to many very interesting small towns and the “take you breath away scenery”. There are gorgeous water falls nearby if you don’t mind a little hiking. We usually try to drive to Ellijay, GA on the way to Blue Ridge. Ellijay is the apple capital of GA and a growth area for wineries. This is a very popular tourist spot in the fall of the year because they have every kind of apple you can think of, and they have apple festivals the first two weekends of October. Our favorite store in Ellijay just happens to serve apple fried pies with hand churned vanilla ice cream. It is a “Died and went to Heaven experience”. There are several attractions near Ellijay as well. 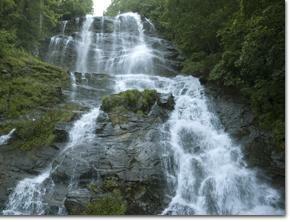 Amicalola Falls State Park, located in Dawsonville, GA, is absolutely beautiful. I have hiked up to see those falls in my younger days but probably wouldn’t do it now since arthritis has decided to come and stay. The scenery, however, is splendid and well worth the hike. Amicalola is a Cherokee Indian word meaning tumbling water and when you see the falls you will understand the appropriateness of this name. 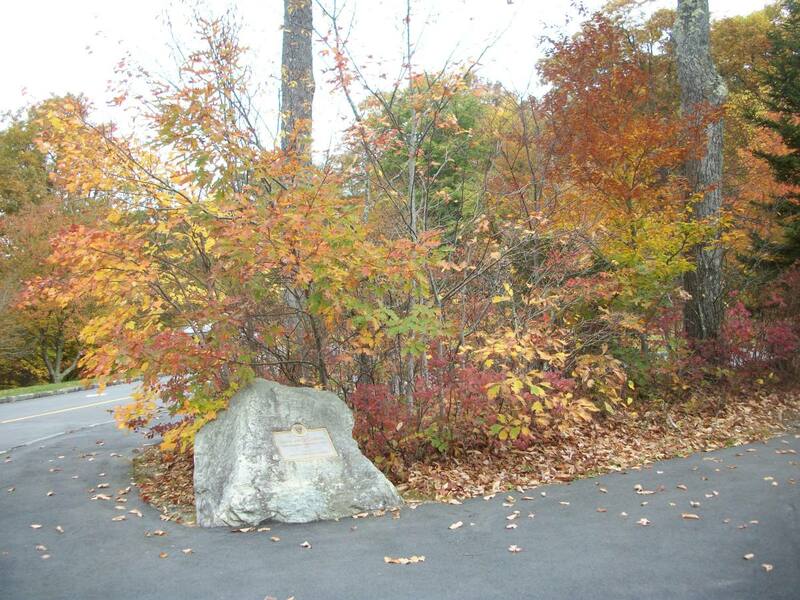 There is also Carters Lake, Fort Mountain State Park and the Chattahoochee Forest in the Appalachian Mountain Ridge which is over 750,000 acres. We plan ahead where we want to go on any given day and if you like outdoor activities there are plenty. 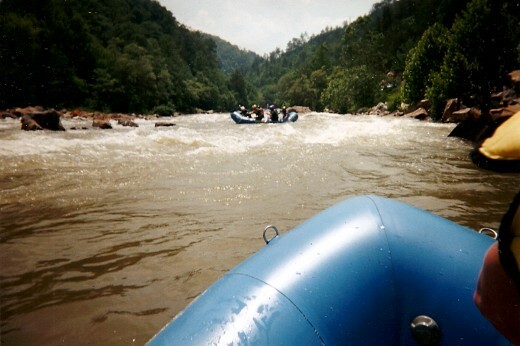 There is white water rafting, kayaking, tubing, boating and fishing, tennis, horseback riding and there is a scenic train ride from Ellijay to Blue Ridge. Helen, GA, is another interesting town to spend the day. 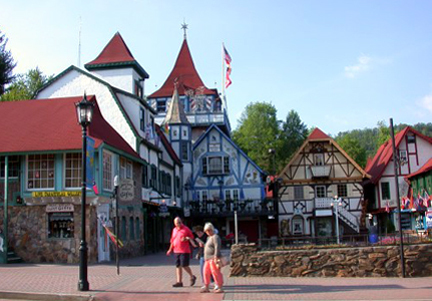 It has an alpine design to its building which gives the town a quaint look, and there are numerous shops for anything you can think of if you like picking up some souvenirs. There are also numerous attractions, like Charlemagne’s Kingdom which gives you a unique trip through Germany in an Alpine Model railroad layout, in HO scale miniature Charlemagne's Kingdom is designed for people for all ages. All of the buildings are actual replicas of buildings existing in Germany and there are over 5000 hand painted figures, over 400’ of railroad track with computerized trains and hot air balloons. Needless to say this is a delight for adults and children. You can also see the scenery in a hot air balloon ride over northern GA. Helen hotels and restaurants are also plentiful. 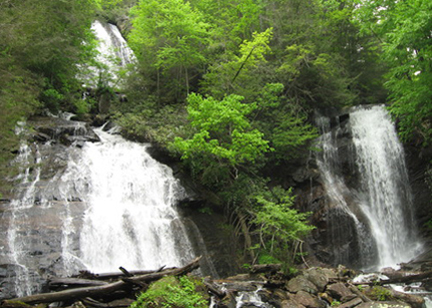 Anna Ruby Falls lies in the heart of the Chattahoochee National Forest. The quietness of the area is broken by the thundering water that flows over the cliff where the Curtis and York Creeks merge together. This water fall is not as difficult to get to but it is also beautiful. The water from Curtis Creek drops 153’ and the water from York creek falls 50 ‘ to form the twin water falls and eventually ends up in the Chattahoochee River. You can rent a tube from the Cool River Tubing and float for 2 and 1/2 hours down the river on your back in the right season. And the last small town I will describe is Dahlonega, GA. Its fame is based on the old saying of: “thar's gold in them thar hills and we invite you to see for yourself!” Gold was discovered in 1828, in north GA on Cherokee land. Within months there were hundreds of men searching and thousands of miners descended on Georgia within a year. The US Government established a gold coin mint in Dahlonega by 1837. Georgia coins from that time period are still in high demand by collectors. Most of the miners left for California’s gold within 10-12 years. There are places set up where you can pan for gold and also go visit a gold mine and you will probably find a little bit of gold but the amount is more like souvenir these days. As you can see the mountains in Georgia are beautiful, and there are numerous things to do to suit anyone's taste. Its a great place for a family vacation or just a couple. 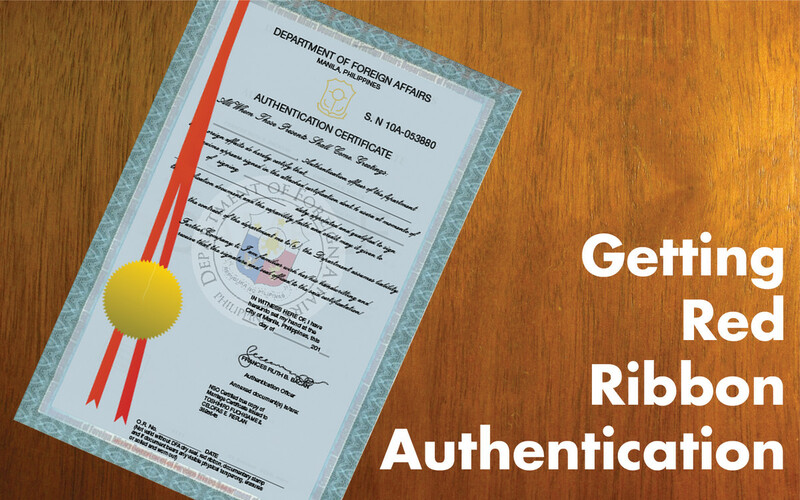 They have flea markets and sell all types of unusual things. The campsites are beautiful if that is what you like. The people are friendly but you can sure find solitude if that is your desire. I would recommend spending some time checking out these little towns as they are interesting and unique. I only covered a few of them so it is up to you to start planning your vacation. Nancy, I didn't know you lived in this area. I love it there and hope to get back for a visit reasonably soon. Thanks for your comments. I loved this hub because your talking about my hometown. I live in Mineral Bluff, which is only about ten minutes north of Blue Ridge. You described it very well. This is a wonderful place to visit. Thanks so much for your comments. Wow - that looks like a lot of fun - and I knew Holle would be on it like flies on honey! You guys need to send me a virtual tour of the Blue Ridge Mountains - or I need to travel there! I think actually though through your hub I DID get a virtual tour. Looks like a wonderful spot to visit! Habee, I figured you did love the GA mountains. Thanks fo the comment. I love the North GA mountains! Beautiful hub! Hello, I am so glad you enjoyed my hub and I appreciate your comments. Thank you for showing this beautiful countryside. So well written, I felt I was alongside of you. God, it is gorgeous. Peggy, I an glad you enjoyed the hub. Thanks so much for your comments. Dallas, I like your sense of humor and northern GA is great. Thanks for your comment. Oh my gosh, this looks absolutely stunning. Both of those videos with the waterfalls were gorgeous. The towns sound interesting and you have certainly found a great cabin to be your temporary home away from home. Thanks for sharing this! Rating this beautiful! 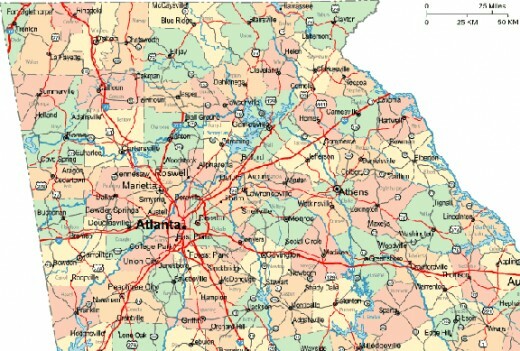 Sandy, It is a nice place to visit and Atlanta has numerous fun things to do also. They have a fabulous aquarium. Thank you for your comment. Never been to Georgia. 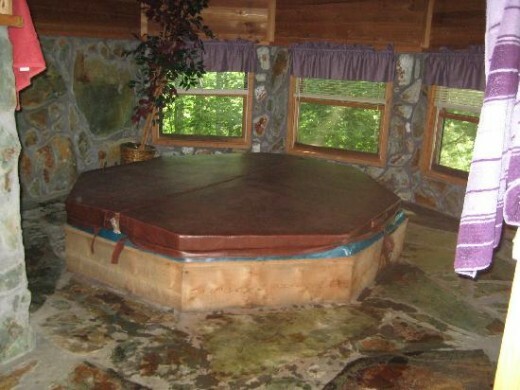 But this looks like a fun place. Cybersupe, Now that is one place I have not had the pleasure of visiting. I have been through quite a lot of PA several times but not in the Pocono Mountains and I'll bet they are beautiful. Thanks for your comments. Pamela, I just knew there was something about you that I liked---You and Hubby are a good match for my Wife and I who are also Mountian Lovers. 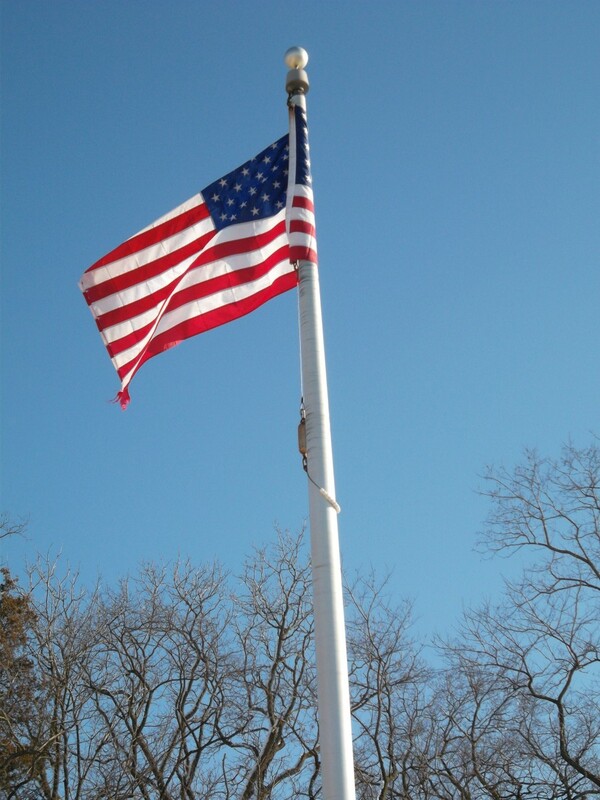 We have a second home in the Pocono Mountains in Northeastern Pennsylvania. Just peacefull and beautiful. Do not spend as much time as we like, but when we do it's worth it. God Bless! Katiem, It is a lovely place to relax. Thanks for your comment. G L Strout I think you will enjoy the mountains. Thanks for your comment. What a neat vacation! We stay in Savannah but have never stayed up in the mountains. Thaks for a great travel idea. Amber, Thank you for your comments. coffeesnob, That must have been nice when your son was there,then you could visit anytime. Thanks for your comments. Carolina, I appreciate your comments. Looks like a lotta fun!!! I like Helen, although I haven't been there for several years. great pics, too!!!! 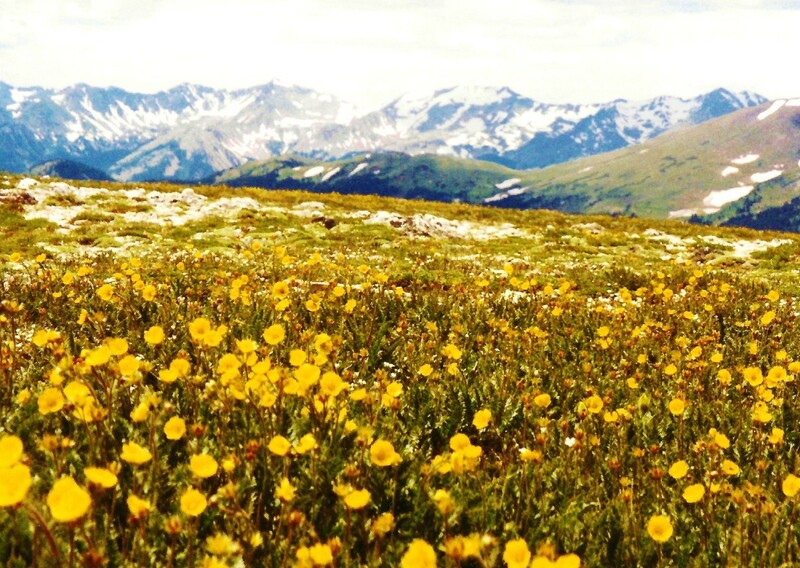 DiamondRN, Your friends mountain home sounds perfect with a trout stocked creek to boot. Thanks for your comment. Eovery, I hope you get to visit the mountains. Thanks for your comments. Sounds like fun! I am jealous. 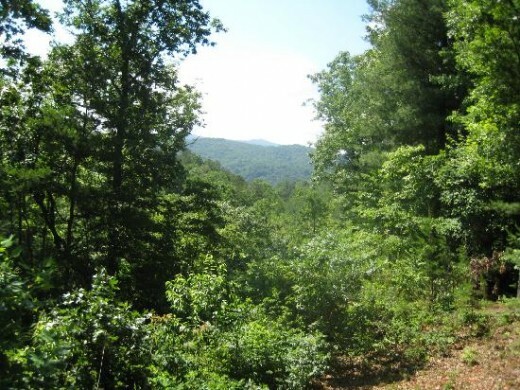 We have friends with a mountain home in Big Canoe, GA. just north of Atlanta. It's like heaven on earth. The residents have their own well-stocked trout creek and pond. 50 Caliber, I think we all would enjoy it. I'm glad you enjoyed the hub. Thanks for your comment. POp, I know what you mean. Thanks for the comment. Darlent, Thank you so much for your comment. Sheila, Yes, with a book sounds good. Thanks for the comment. Now that's a vacation! I love seeing photos of the towns, too. And the porch swing...wish I was there with a book right now. I just love the cabin and the scenery. I could honestly pack right now and head on out.